Santorini is what Greek dreams are made of. 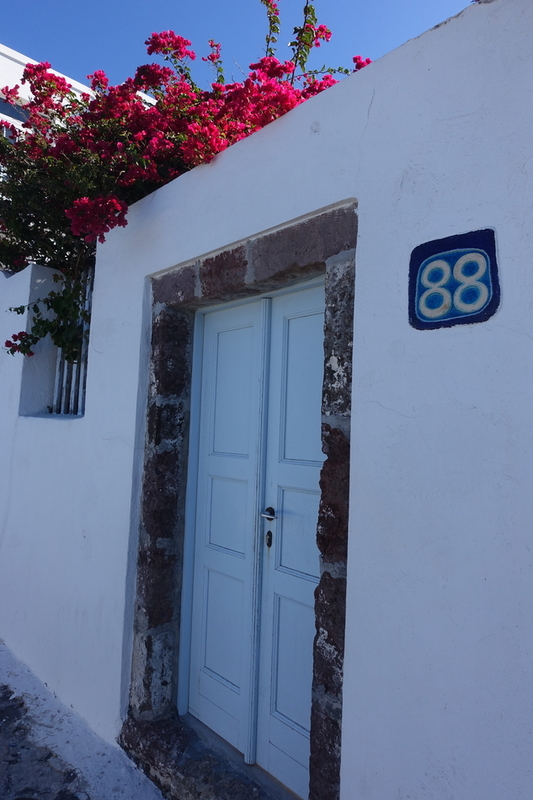 Endless blue skies, whitewashed houses overlooking the waveless sea, and stellar sunsets seemingly every night, showcasing the sky, the sea, and the houses perched between the two. 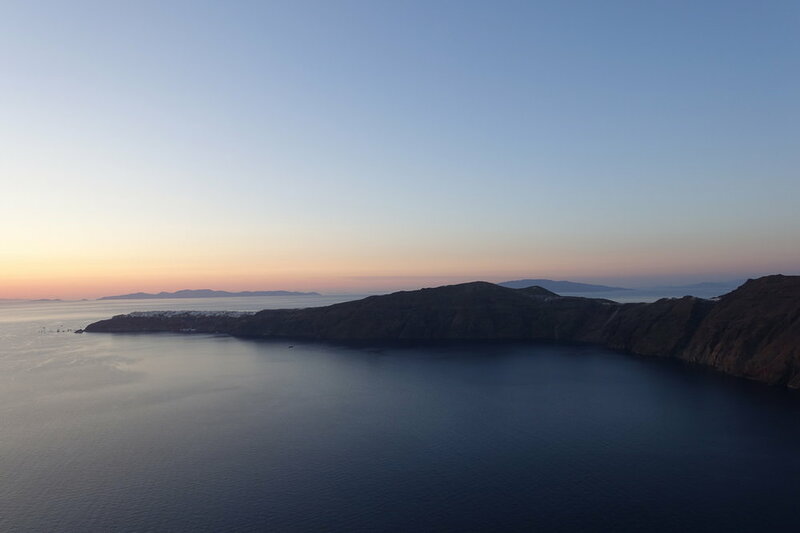 It's by far the most popular of all the Greek islands with foreign tourists, and for good reason - who can resist what many call the most romantic sunset in the world? 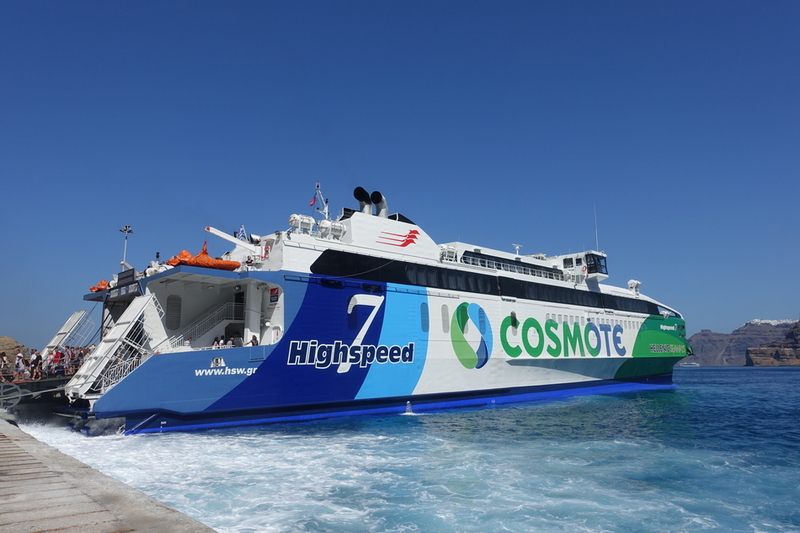 We sure couldn't, and took a high-speed ferry from Crete to Thera, the main island of the group of islands that make up Santorini. By the time we got our rental car, checked into our hotel, and realized that Danny didn't exactly have a firm plan for our three days on the island, we really only had about a half day remaining. 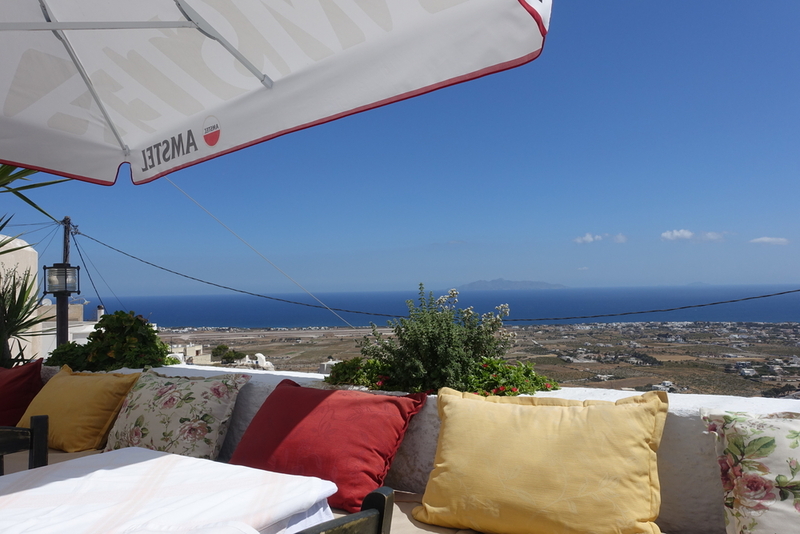 We ate lunch with a view in Fira and attempted to swim at Perivolos and Perissa Beach. Santorini isn't known for its beaches, and the black sand ones we visited are known as two of its best - hard for us to believe after coming from Crete where we were spoiled for choice, but Santorini is basically just the remains of what was a huge volcanic eruption, in fact, probably one of the largest in history. The caldera of the volcano is where homes, churches, hotels, pools, and restaurants now perch, making for gorgeous photos but lackluster beaches. D - I was in charge of making the plans for our time on Santorini, and unfortunately I kind of dropped the ball from the start. While I wrote down many things that we could do, I didn't really write down what order to do them in or where to start. I don't know...I was working a lot those days, and searching for apartments, and probably, to be honest, watching a lot of YouTube instead of finishing up the plans. 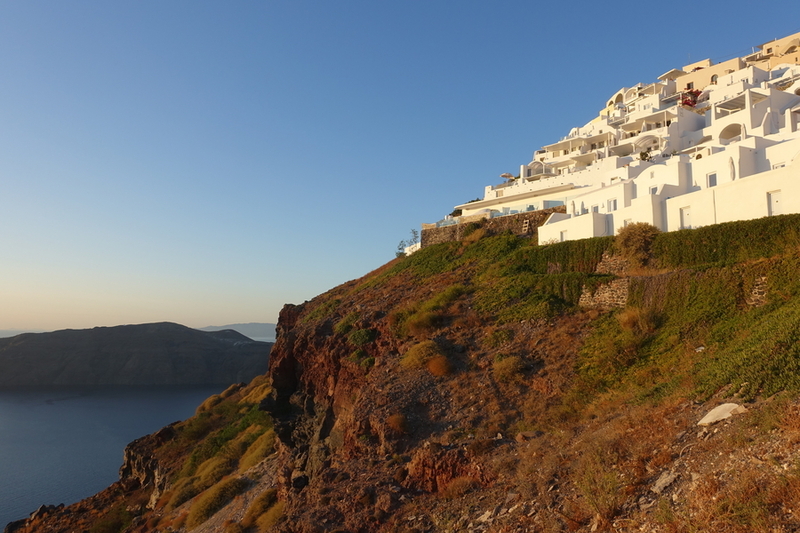 Thankfully, Santorini is pretty forgiving to people without the best of plans. There's honestly not a ton to do on the island in terms of activities and sights, it's more a place to just kick back and relax. D - The sunsets were incredible, but a bit stress inducing (to me at least) as well. There are thousands of people who migrate to Oia every evening, each jockeying for position for the very best spot on the island to watch and take pictures. After reading so much about all the best sunset spots on Santorini I think I put a lot of pressure on myself to create an idyllic sunset experience. As a result, we ended up power-walking a lot on the first evening trying to find the perfect spot. Nothing says romance and relaxation like pushing your way through crowds while anxiously looking back at your spouse and saying, "c'mon!" 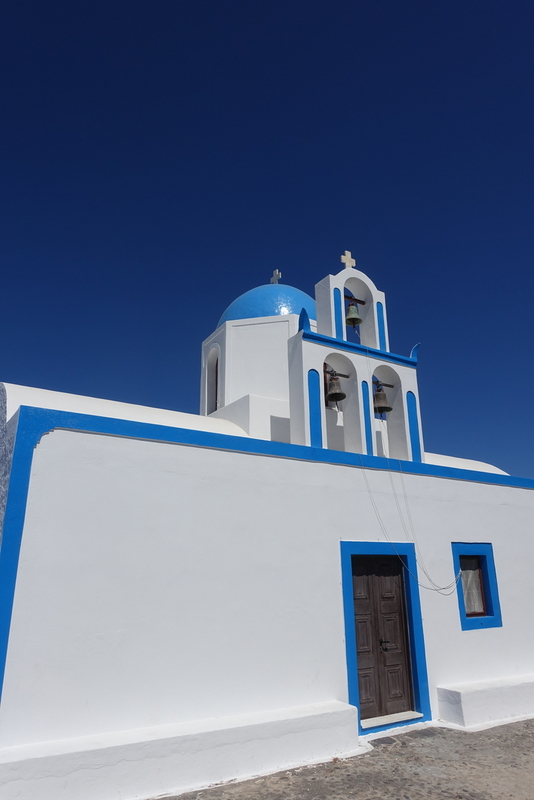 We spent the majority of our second day on Santorini walking from Fira to Oia. 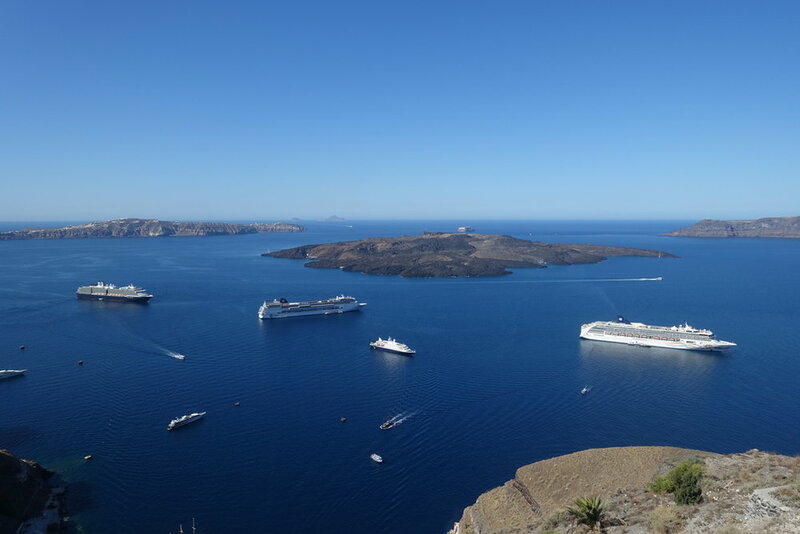 We parked our rental car near the archeology museum Fira and began our 9km trek along the caldera and the sea. This was probably my highlight of our time on Santorini. Sometimes we were in towns, sometimes we were in the barren volcanic landscape, and other times we were walking alongside secluded, sumptuous resorts, wishing we could sneak into their pools to cool off for a moment. It was hiking at it's best, really - much of it was in nature, but there were also chances to stop for a drink or an acai bowl, like we did (you know our policy on acai bowls - can't say no, especially when on vacation!). 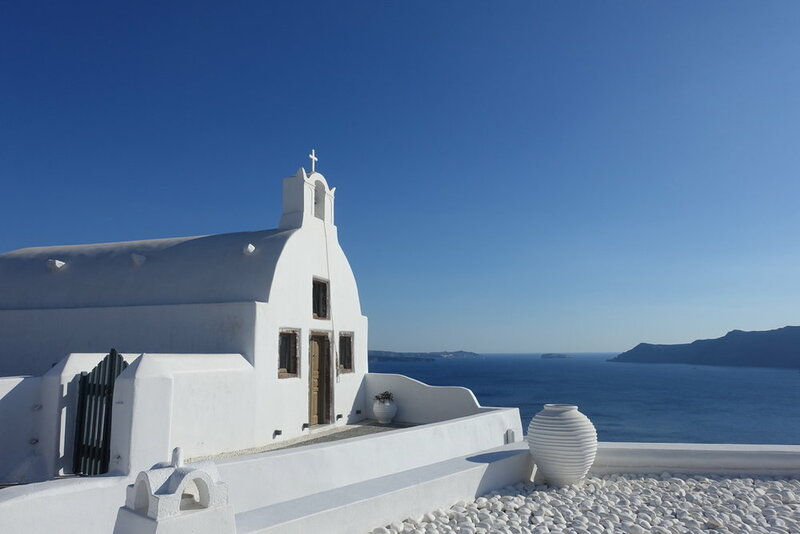 On top of that, the finish line was Oia, the definition of both picturesque and touristy. Some of the most photographed places on the island are in Oia, including many of the most popular sunset spots, but like I said, it's touristy: the population of the town is roughly 1,500 but it receives over 1,500,000 visitors a year. D - We got off to a later start than we would have liked on our hike and as a result, ended up doing much of it in the hottest part of the day. We were super hot and sweaty and, at times, it was like a scene out of the song "Ironic," surrounded by beautiful pools that we couldn't swim in. It was an awesome hike though, especially when we found the occasional small tree to crouch under together for the shade. If we could do it again, I'd definitely make sure that we started a few hours earlier. After our hike, we took the bus back to our car, relaxed for a little while at the hotel, and decided to watch the sunset from the small town of Imerovigli. It's a cool place to watch from, because you have a great view of the entire caldera, as well as distant islands and we had the view all to ourselves until Danny decided we could get an even better view by walking out to Skaros Rock. Danny ended up climbing to the top of the rock with a few other adventurous souls, and while it meant we each got to watch the sun set solo, it was still one of my favorites, as we weren't crowded up with hundreds of others - just us and the sea and amazing nature surrounding us. D - I wasn't trying to abandon Shannon for the sunset, I just didn't realize from afar that you had to do a bit of scampering to get up to the top of the rock. While Shannon is normally a fine scamperer (scamperist? ), she was wearing flip-flops and didn't want to risk hurting herself. Similarly, I didn't want to risk being a thoughtful husband and so I happily scouted out the top without her and took pictures of the sunset by myself. In retrospect, it seems like a real jerk move but I promise in the moment it didn't seem so black and white. Again, if I could do it all over again, I'd probably do things a bit differently, but it was still a pretty sunset. We ate at Metaxy Mas Tavern, which is really the only place we ate at worth mentioning. 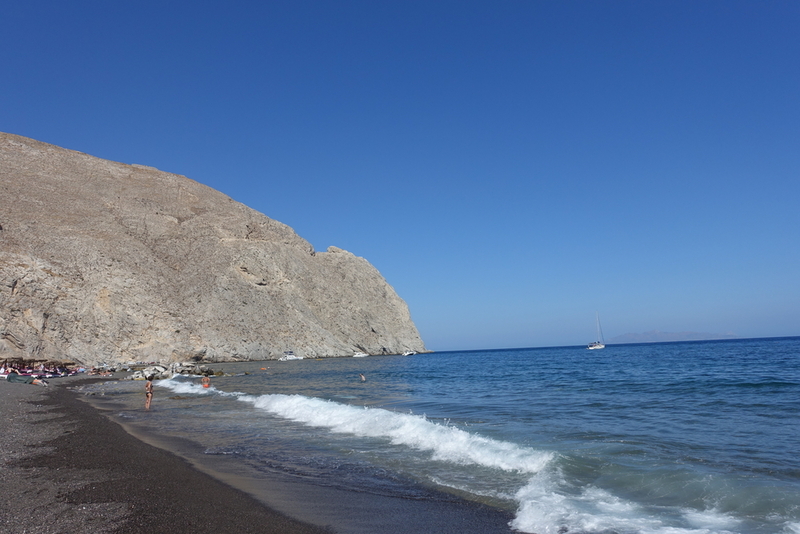 I don't think we're really the average tourist that comes to Santorini prepared to drop three figures on a meal without batting an eye, so we ate at a Thai restaurant one night and an Indian place another. It kept costs down and also kept us from getting tired of Greek food (even though we loved nearly everything we ate over the two weeks we were in the country, it can be a long time to eat just one type of food over and over!). Again adding to the list of things I'd do differently if given the chance: our entire trip in Greece, I was scouting for apartments in Madrid pretty aggressively. Because of this, I often took advantage of WiFi in restaurants to search online and left Shannon basically by herself for large portions of meals. We didn't even end up finding an apartment while in Greece, so I wish I just would have put my phone down and enjoyed our time together. We spent the rest of the day in Oia. 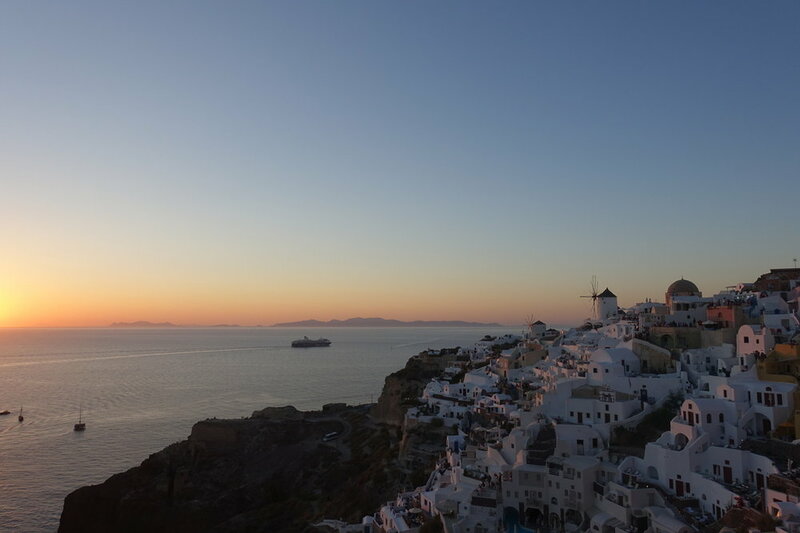 Though we'd been there every day, it was only for the sunset, which was a very hectic and crowded time, and when we'd arrived after our walk from Fira, we were sweaty and tired, and didn't really feel like taking our time and going into shops that caught our eye. As this was our last chance, we were on the look out for a Christmas ornament for our tree that we might one day set up again (we finally settled on one that I sadly broke a few days later in Milos), as well as a hat for Danny (he eventually decided that fedoras aren't his look). 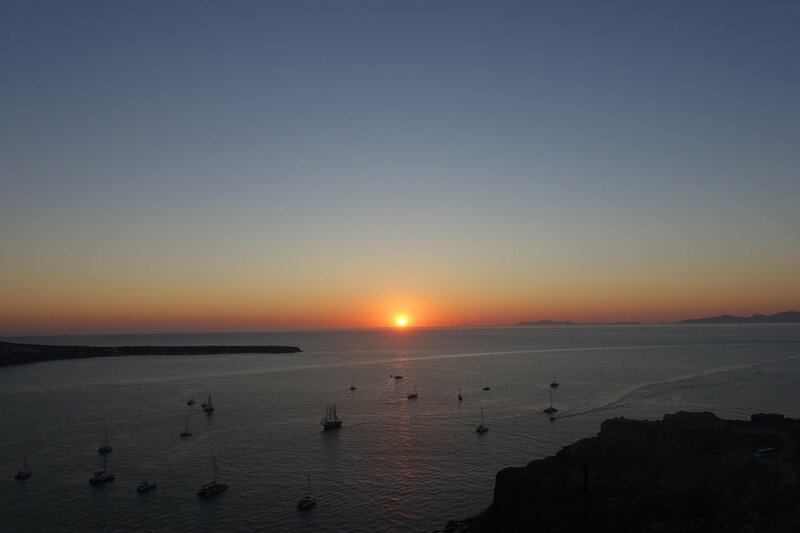 For our last Santorini sunset, we decided to watch from the three domes, and then once the sun had set, walk to the castle as many people start clearing out as soon as the sun hits the horizon. Our plan worked pretty well, and we were even able to get a few pictures of all the people still taking pictures...I mean watching the sunset. D - Though I mentioned a lot of things that I might've changed about our time on Santorini, we really did have a great time on the island. Our time there also re-enforced a lot of valuable lessons to me: put your phone down (no matter how important it may seem in the moment), stop trying to capture the perfect moment on camera and just embrace living in the moment, and of course, it's better to be early and relaxed, than late and stressed out. If it looks like all we did on Santorini was take pictures of white buildings and watch the sunset...well, you wouldn't be too far off. We did a few other things too, but the highlights really were the uniform Greek architecture style, contrasted against the dark caldera and bright sea, and finding different places to watch the setting sun each evening...and dodging the crowds that get unloaded by cruise ships every morning by doing a bit of walking, checking out the unique beaches, and staying at the hotel during the day when everyone else was out. 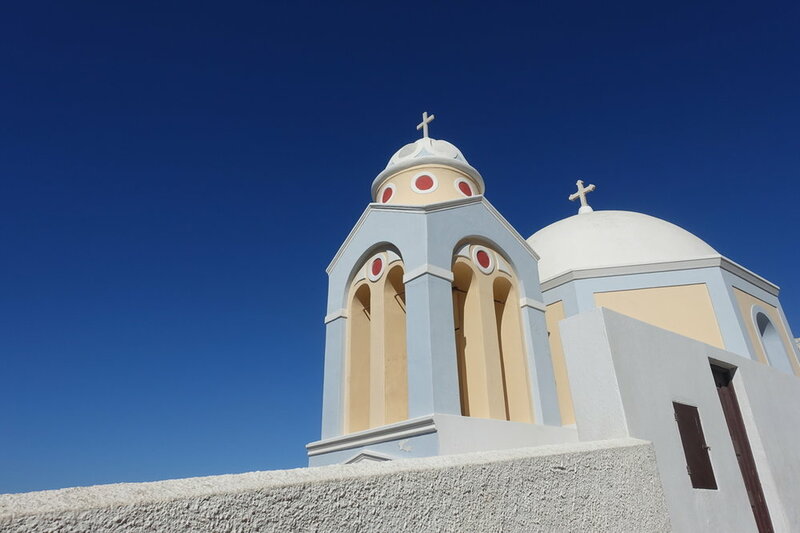 It took a trip to Santorini for me to understand the hype, to realize why people go - and return. It's truly breathtaking, being on the remnant of a volcano in the middle of the sea, watching the sunset (either alone or surrounded by strangers), and both the creation and what humans have created on the island is beautiful and amazing.